Leaf retention: Drought- and cold-deciduous. Mature Size: 3-6' high and 3-6' wide. Flowers: Tiny, white, sometimes with a yellow throat, in rounded, flattened sparse clusters at the end of branch tips, fragrant. Leaves: Green, rough textured, serrated margins, edible with a strong lemon-oregano flavor. Fragrant when crushed. New leaves are light green. Wildlife: Attracts pollinating insects. Its flavor usually discourages browsing mammals. Origin: New Mexico, Texas, Mexico through Nicaragua. USDA hardiness zones: 9-11. Severely damaged at 29°F. Root hardy to 20°F. Drought tolerant: Yes, but loses leaves. Water after becoming established: Monthly to weekly, depending on temperature and appearance. Soil: Well drained, low to moderate organic content, pH 6.1-7.8 (slightly acidic to slightly alkaline). Planting: Place in ground after danger of frost is over. Can be grown in pots. Prune: Trimming stem ends may cause fuller growth. Prune to shape after flowering. Before the first frost of fall or winter, cut the plant at the ground and hang it inside, upside down, to dry the leaves for use. Litter: Low except dropped leaves in cold and drought conditions. Uses: Ornamental, culinary. The leaves will crumble easily when dried and are used as seasoning for their lemon-oregano flavor. Many people prefer to use Mexican Oregano in place of standard Oregano (Origanum vulgare). 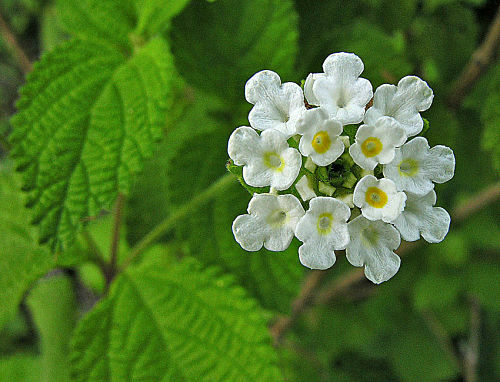 This plant is a member of the Verbena family (Verbenaceae). Another plant, an ornamental named Poliomintha maderensis: Lavender Spice, is also called Mexican Oregano.